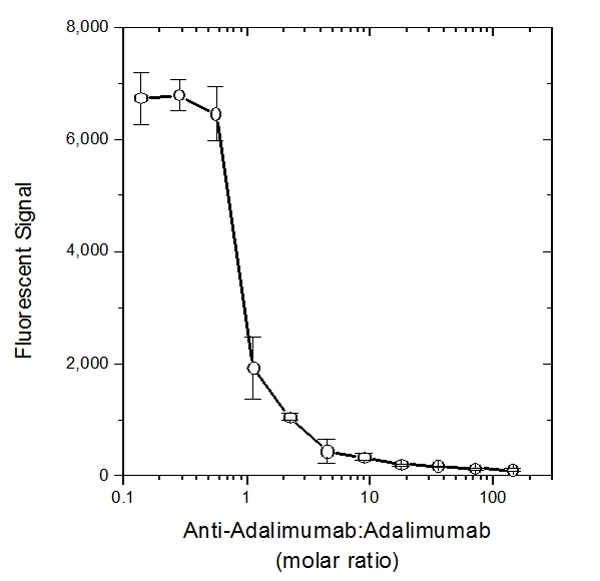 Inhibition of Adalimumab binding to TNFα by HCA202. TNFα was used as the coating antigen followed by a pre-incubated mixture of Human anti Adalimumab (HCA202) titrated into a constant amount of Adalimumab. Free Adalimumab still capable of binding to the plate was detected using Goat anti-Human Fab antibody (STAR126P). Goat anti Human IgG F(ab')2 antibody recognizes Fab and F(ab')2 portion of human IgG by IEP. It reacts with other human immunoglobulins through common light chain reactivity. Goat anti Human IgG F(ab')2 antibody demonstrates minimal cross reactivity with bovine, horse and mouse IgG; other species have not been tested. No reactivity is seen with the Fc portion of human IgG or non-immunoglobulin serum proteins. This antibody is a performance tested, matched reagent for use with Bio-Rad HuCAL antibodies. Back, J.W. et al. (2012) Selecting highly structure-specific antibodies using structured synthetic mimics of the cystine knot protein sclerostin. Protein Eng Des Sel. 25: 251-9.